The biggest corporate hiring spree in five years ended a weeklong slide on Dow, with the economy added 244k jobs last month (consensus: 185k). The Dow Jones rose 55 ponts to end at 12,639 after surging as much as 175 points. Week-On-Week (Wow), the Dow Jones slumped 1.3% amid fears of an economic slowdown, weaker-than-expected earnings and a major sell-off in commodity-related counters. 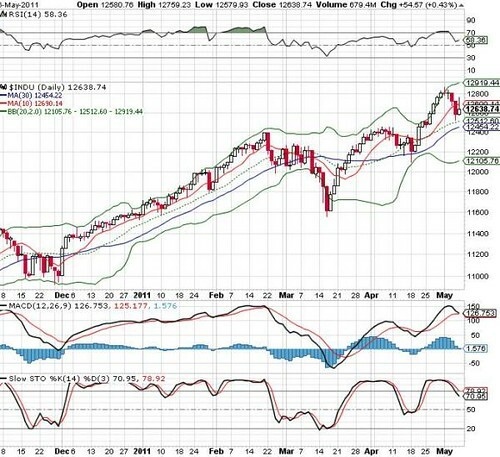 Dow Jones Will Has More Downward Consolidation If 30-Days SMA Is Broken.